This is a machine vision/instrumentation camera that I got after searching around for regular video cameras and deciding that everything I ever take video of is in rapid motion and so I need a camera that has a global shutter. The Sony IMX174 is a strange thing - a global-shutter CMOS. Hopefully one of the first of many to come? Combined with the astonishing speed of USB3.0, it is capable of recording raw HD video at 160fps or lower resolutions at up to 1000fps. The global shutter speed can be as fast as 5us and it can synchronize its trigger to the outside world, essentially making it a visual oscilloscope. Combine that with a large (1/1.2" sensor) with good low-light performance, and you get some really nice high-speed video for much lower cost than the next nearest thing that could shoot raw HD at 160fps. The downside is that it basically needs a PC tethered to it to record, and it chews through RAM faster than you can convert and save video, even onto an SSD. So the record time is limited at high frame rates. 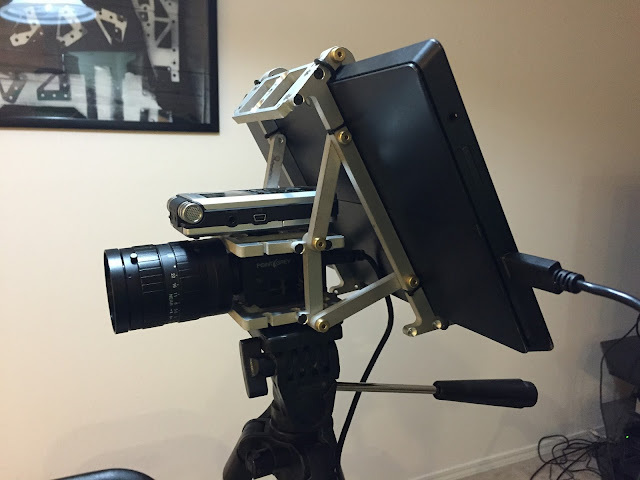 I use a Microsoft Surface Pro 2 as a portable monitor and recorder for the camera, since it is a full-featured Windows tablet with USB 3.0 and enough RAM (8GB) to handle the task. It does have some trouble converting and saving video at full frame rate while also recording, so I've modified one of the Point Grey example programs to only buffer into RAM (deferring the convert/save step until later) for maximum frame rate. This gives about 20 seconds of record buffer at maximum frame rate. I've used it to create some interesting high-speed and synchronized videos, as well as help troubleshoot on some projects. Below are some of the most fun results. The quality of the capture and processing software varies for these examples. See the post archive for the technical progression.